Designed for rigid or articulated vehicles, these devices, both wired and wireless, utilise audio and visual technologies to alert drivers to the presence of obstacles behind the vehicle. All systems activate automatically when reverse gear is engaged; requiring no driver input. “Over 28% of all commercial vehicle accidents occur while the vehicle is reversing”. With the number of cyclists on the road increasing every day, so are the number of accidents involving them. The ETS LED CYCLE SIGN is an innovative aid to trying to help reduce these accidents. Fitted to the rear of the vehicle, our LED CYCLE SIGN illuminates, and flashes in sync, when the left hand indicator is active. The cyclist can then take the necessary precautions to keep back. This is particularly useful when the vehicle is driving slowly or through large cities. Blind spot take care on a white background. Beware vehicle turning – Stay Back on a black background. An ultrasonic system that has been developed with the safety of Cyclists in mind. The majority of accidents involving cyclists and HGV’s happen when the HGV is turning left as the driver, very often, cannot see the cyclist. 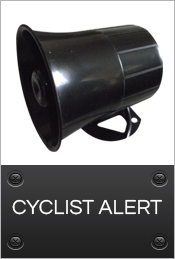 CYCLE SCAN has been designed to warn the driver when cyclists are approaching on the near side with an audible warning and illuminating LED on the dashboard. 3 or 4 ultrasonic sensors are mounted to the near side of the vehicle. Beeper and LED mounted in the cab to alert the driver. Talking Sounder to warn cyclist and pedestrians when the vehicle is turning left and the indicators are on. 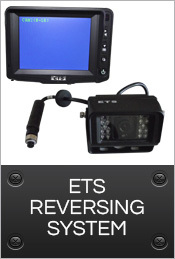 Over the last few years vehicle safety devices such as extra mirrors or camera monitor systems with wider viewing angles have become mandatory. Even a relatively minor accident can be costly to a fleet operator. Apart from repairs to the damaged vehicle, there is downtime and replacement vehicle hire costs to consider…..not to mention any insurance or legal expenses! 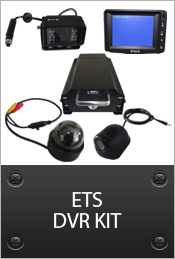 The ETS DVR Kit is a 4 channel hard disk recorder which records for up to 2 weeks. It can simultaneously record real time images with data such as time, date, location and speed. The information can either be downloaded via an SD card or the cradle can be removed for full analysis of the vehicles driving on a PC. By recording footage from vehicle mounted cameras, the system provides an excellent witness; with accurate evidence in cases of false claims, crash for cash and incidents of theft from the vehicle or vandalism. This is a bespoke kit and can accommodate up to 6 cameras. Please contact us with your requirements.